The book by Hristo Hristov, an investigative journalist and documentary writer, entitled “The Empire of Overseas Companies” traces the creation and development of companies with Bulgarian involvement during the communist era and their fate after the political changes after 1989 in Bulgaria. The activities of these companies was connected primarily with the siphoning-off of capital from Bulgaria. This was a problem which remained after the collapse of the communist regime and the transformation of the former communists’ political power into economic might during the first years of the transition to democracy. 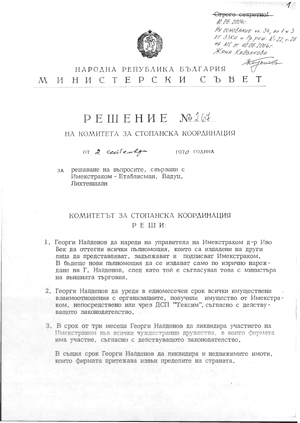 Hristov establishes for the first time that the government of the Bulgarian Communist Party during the 1960’s created the first overseas companies in the aims of carrying out secret commercial deals. The overseas companies were the instrument through which party and state policies were carried out while the State Security Service was the organisation which concealed the transactions. For example, the first Bulgarian overseas company, “Imekstrakom”, was set up in 1961, in Lichtenstein, by Georgi Naidenov, an officer from the Bulgarian intelligence services. Bulgarian involvement in the company was kept hidden since the Bulgarian communist party used it to carry out the first secret arms deals with the Algerian Front for National Liberation, which was in a state of armed conflict with the French authorities. This company marked the beginning of the empire of overseas companies which at the end of the communist era was more than 450 in 70 countries throughout the world. Created under the pretext that they were needed to conquer new markets, these companies were registered initially in a number of developed Western countries and other countries of the Third World. After the collapse of communism they became one of the channels for extracting national capital from Bulgaria. The study shows that no less than 712 million dollars were invested for the purposes of setting up these companies, and the necessary increases in constitutional capital to cover up for their losses. In 1991 it was established that approximately 1 billion US dollars of non-declared profits were still in bank accounts in foreign banks around the world. The Bulgarian state has still not been able to recoup these monies.